Join us this week as we welcome back the California rock band that is Masque. Band members Tony Kelly, guitarist Kevin James, bassist Bruff Brigham and drummer Scotty Kormos are bringing their explosive new live show on tour for the first time in over twenty-five years. 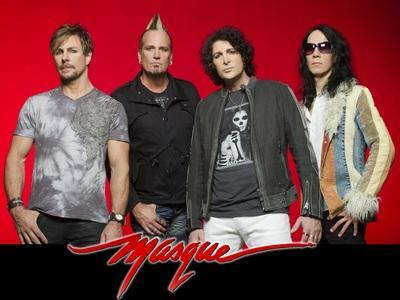 Masque burst onto the 80s Hollywood glam rock music scene and quickly became one of LA's most popular bands. Fueled by social media exposure, the band experienced a major resurgence in popularity with fans around the world. Renewed popularity led to a Masque reunion in 2010 to record the song and film the video for “Body Mind & Soul” directed by Mark Jacobs for Zzyzx Films. We will catch up on all the latest with MASQUE, get a behind the scenes look at their music, feature songs from their brand new EP produced by the multi platinum producer Keith Olsen, and ask them to share their message to the troops. Please be sure to visit Masque at http://masqueband.com/ and spread the word. Fans are welcome to call in and chat live with Masque during the show. If you would like to participate in the live chat during the show, you must sign up on the show site first and then log in during the show. More great music for a really great cause! And as always we will give shout outs to our deployed military listeners. Be sure to join us, Sunday September 23rd 2012 at 4:00 PM EST! Our message to the troops....WE do what we do, because YOU do what you do.